Bristol Industrial & Research Associates Ltd (Biral) was established in 1975 and is a global supplier of meteorological sensors for aviation. Our scope extends from sensors to measure wind speed and direction, temperature, precipitation, solar radiation to visibility and present weather sensors. Biral’s SWS and VPF range of visibility and present weather sensors are used throughout the world as part of aviation ground control and meteorological monitoring systems. These sensors along with the ambient light sensor form the core of RVR monitoring systems used to control the safe landing of aircraft in reduced visibility conditions. Our present weather sensors provide automated precipitation classification and monitoring that forms a vital part of the METAR signals broadcast to aircraft. Transmissometers were once the reference sensor on airfields due to their direct measurement of extinction coefficient. However, their limited measurement range and high capital and operational costs has seen the more cost effective forward scatter meters (FSM’s) become widely used. All Biral visibility and present weather sensors meet the requirements of ICAO and WMO for use in aviation systems including RVR. Calibration is in accordance with ICAO 9328 and is traceable to a reference standard transmissometer. Declarations of Suitability for Use as per EU Regulation 552/2004 on the interoperability of the European Air Traffic Management network are available for all sensors. Smaller airfields without the need for RVR may cluster a set of sensors around a met-tower, whilst larger airports have sensors at both ends of a runway. The largest applications can have three sets of sensors per runway in addition to a dedicated set for meteorological observation and forecasting. The Biral sensor range is perfectly suited to the varying needs of all these installations. Biral visibility and present weather sensors have a range of features that reduce maintenance to a minimum. All Biral sensors have simple to use field test and calibration kits, allowing the operator to maintain a high degree of confidence in the measurements without the disruption and expense of removal for offsite calibration. The detection and reporting of thunderstorms is important in the aviation industry, supporting both the safety of ground operations and the provision of meteorological data to aircraft and forecasting authorities. Our Thunderstorm Detector has been developed to be compliant with FAA regulations for lightning detection systems used at airfields. The BTD-300 Thunderstorm Detector is a standalone sensor that reliably detects the presence of all forms of lightning to a range of 83km. The distinctive quasi electrostatic operating principle gives the detector a very low false alarm rate and the ability to warn of the risk of overhead lightning, which network systems are not able to do. 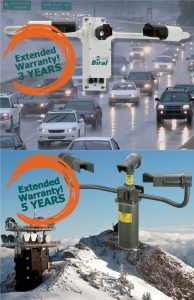 Biral forward scatter Present Weather Sensors measure visibility and report precipitation type and intensity. These compact sensors can identify a wide range of precipitation types including drizzle, rain, snow, hail, freezing rain and other forms of frozen precipitation. Precipitation type is reported using a combination of WMO Table 4680 and METAR codes. The range of precipitation types identified varies with sensor model. Designed to comply with specifications and guidelines produced by the International Civil Aviation Organisation (ICAO), World Meteorological Organisation (WMO) and the Federal Aviation Administration in the USA (FAA), the ALS-2 meets all the requirements for use in typical RVR systems. The ability to connect the sensor directly to a Biral visibility or present weather sensor and have the background luminance data incorporated into the visibility sensors data string simplifies system design and construction.